I just spilled an entire glass of water and did a backroll into the login table. Wheeee! Ouch. I think I drank too much. 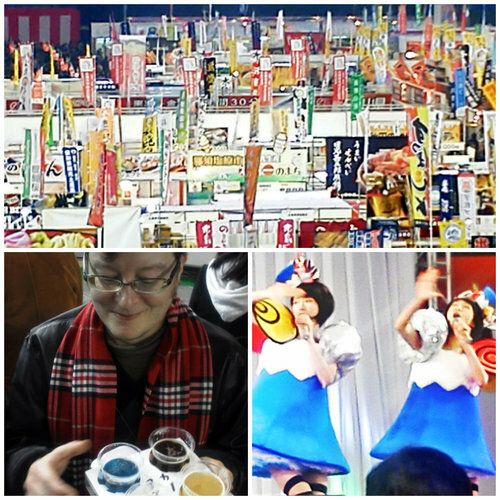 Tod & I spent most of the day at the Furosato Matsuri 2014 Tokyo, a huge "hometown festival" in Tokyo Dome with hundreds of stalls vending food and drink from different parts of Japan. We visited the booth of our favorite part of Japan, Nijima, four times. They were selling glasses of "shimajima" or local sake. So of course we had to have some. It felt like camping, but more urban. We ate and drank our way through several delicious prefectures, enjoying vegetarian soup with mamebu walnut-mochi from northern Iwate-ken, tai chazuke rice soup, fried potatoes from Hokkaido, and melon ice cream. In between stuffing our faces, we watched some shows including the Yanakiku duo, who made me laugh. Somehow we spent 6 hours in the Dome, and it was fun. I think I will have a headache tomorrow from hitting the table more than from the sake.